Ramona Venema works as a research assistant in the Turning Over a New Leaf project. Her previous post was devoted to medieval cooking. She maintains her own cookery blog. The medieval bestiary has already been discussed in this blog. However, while the previous post focused on beasts you may encounter in real life today, such as owls, beavers and cats, the wildly popular bestiary also contained more exotic animals, which you will only encounter in your dreams – or rather, in your nightmares. I find the odd creatures in this blog fascinating, especially since medieval individuals saw them as part of their own world. 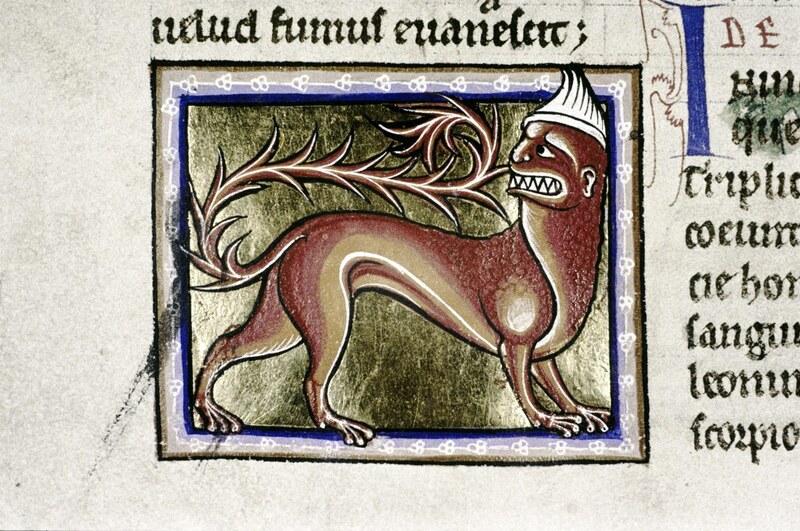 Let’s have a look at a small selection of bizarre beasts from medieval times, which appear to have walked straight out of the Harry Potter novels. In fact, two of them do appear there. First of all, there is the unicorn. The unicorn is familiar to us because of its presence in popular culture, where it features on t-shirts and in a great deal of photoshopped images (see this Google search result). In medieval times the unicorn was seen as the enemy of the elephant: it would attack the elephant with its horn or hoof, piercing its skin. The unicorn was almost impossible to catch. The hunter used a virgin girl to lure the creature closer. 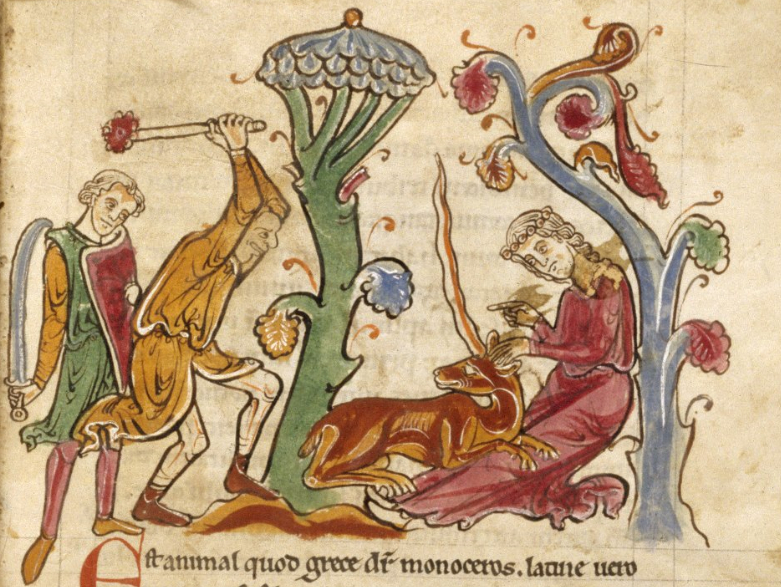 When the unicorn put his head in the virgin’s lap, the hunter took his shot – or, as in this image, he used his club to strike him down. As some might recognize from reading the Harry Potter books, which deserve to be mentioned in a post devoted to such exotic creatures, one could use the horn of a unicorn to detect poison, and even counter its effects. The horn was dipped into the liquid, which became safe to drink. The story goes that in powdered form the unicorn’s horn could be used as an aphrodisiac – which is no surprise, really, given the whole horn-in-virgin’s-lap scenario. In sum, it was quite a nifty object to have at your disposal as a medieval king, who was traditionally the one to receive the horn of a captured unicorn in medieval stories. Then there is the caladrius. This bird may not seem particularly unusual at first, but it has remarkable properties. Living in the king’s house (royals really liked their mythical creatures), the white bird could spot and cure a sick person. 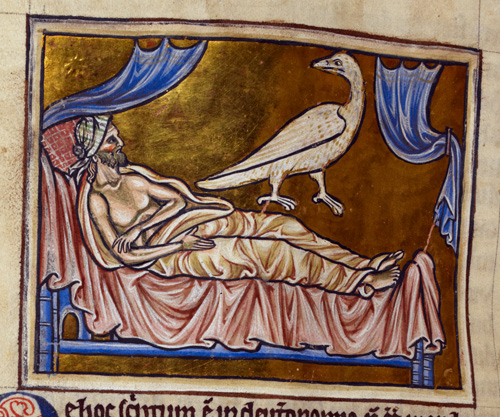 The bird is depicted sitting on a bedridden person, as in the picture above. When it looked away, the person would die. If it looked straight into the patient’s face, however, there was hope for a full recovery. The caladrius would “draw” the illness into itself and fly toward the sun, where it would burn up. The man in the miniature was lucky, given that the bird is looking straight at him. A third creature of interest seems ready to attend a Brazilian carnival, as seen in the image above. You may also recognize him from the Harry Potter books: the mandrake. It concerns a plant with a human-shaped root that would shriek when it was pulled out of the ground. The shriek would drive the person who pulled it out mad; it might even kill him. The medieval bestiary therefore suggests giving this job to a dog. 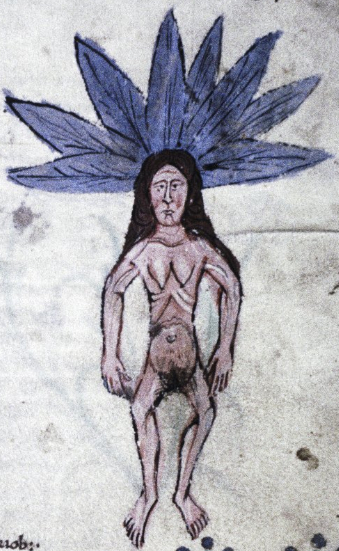 The dog would be tied to the plant and it was persuaded to move away from its owner with a piece of meat, thus pulling out the mandrake – well out of reach of the owner’s ears. The last creature in this exotic parade would make you run the other way when encountered in a dark alley. The manticore, a red and feisty beast, had the body of a lion, the tail of a scorpion and the face of a man. In addition to his appearance, another quality would make it wise to run the other way: the manticore’s favorite dish was human flesh! Want to know more? A great website about the bestiary and its strange creatures is The Medieval Bestiary, which also proved useful for this blog. Other images may be found in the British Library Catalogue of Illuminated Manuscripts. Also check out, lastly, Jenneka Janzen’s post on bestiaries, which features a comprehensive list of interesting bestiaries. Happy hunting! This entry was posted in Visiting Bloggers and tagged Bestiary, caladrius, Harry Potter, manticorn, Manuscript, unicorn. Bookmark the permalink.